Ms. Ramaa Subramaniam received REX Karmaveer Global Fellowship (RKGF 2015 -16) honour and the Karmaveer Chakra instituted with the UN. 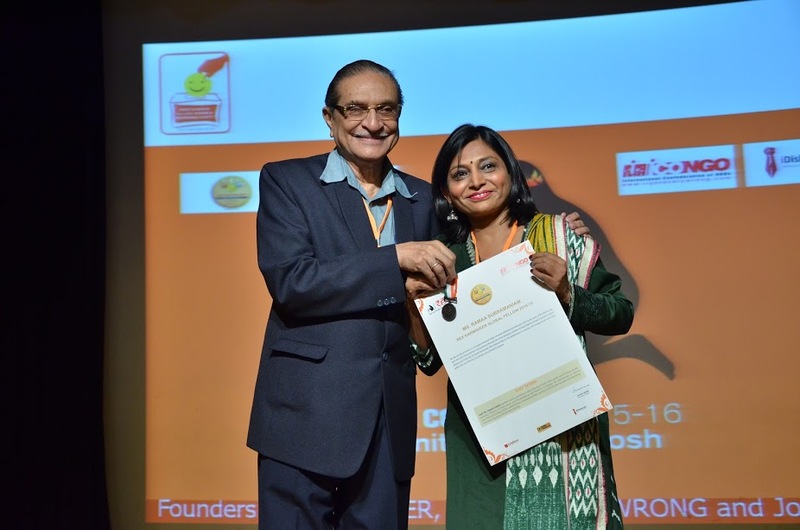 RKGF and Karmaveer Chakra are for people working on social causes and also for people from all walks of life, who are inspiring positive change and helping people in our society to have a positive mindset and thus impacting collective change. Thus, RKGF goes beyond doing something for social causes or charity and is given to people from across sectors who are making a positive contribution for impacting a positive mindset to change for the better. Ramaa was instrumental in many offline and online initiatives for Elders thru Social awareness, Sensitising and conducting events etc. She founded an exclusive search portal www.SilverInningsHelpline.com for senior citizen, which has contact details of all day to day needs. She also founded a social enterprise ‘Pride Age’ for conducting events and to provide need based services for all ages. Rex – Ideas For Action Conclive. The award is instituted by iCONGO in association with the United Nations. It recognises change makers, people who put the mission before the commission. Posted on December 2, 2016 February 16, 2017 by Pride AgePosted in Events, InspirationalTagged Karmaveer Global Fellowship 2016.